Chris Stewart loves Spain as much as ever and his latest book – the ‘fourth in the trilogy’ – brims with stories about his life in Las Alpujarras. Famous for Driving over Lemons (1999) we thought, by the third book – 2006’s The Almond Blossom Appreciation Society – things had petered out a bit. This is a return to form and, arguably, as good as the first book. It’s beautifully written, self-deprecating and often funny – how can a four-hour walk to consult a faith healer about his inflamed willy not be? 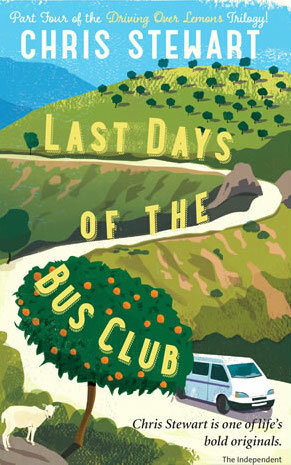 Last Days of the Bus Club centres around life at El Valero where he and wife Ana live as empty-nesters now that daughter Chloé (who caught the school bus of the title) has been dispatched into the world of work and university. In Granada he encounters the stress of tracking down a 4B pencil to complete her university application form. There are flashbacks to his teenage self including as a manual labourer, giving insight into his future as a farmer. He’s still one but these days, enjoying the fame his books have brought him, he gets to judge things like a tuna-cooking competition in Conil, a coastal town near Cádiz. With his late friend, Michael Jacobs, they try their best not to be mistaken for gay ice-cream salesmen. Public speaking (in Spanish) now features regularly in his life. His attempt to convey the merits of a co-educational system at Orgiva’s school falls a little flat and is interpreted as extolling the joys of discovering your ‘inner bi-sexual’ (Chloé continues to help with his speeches to this day). A favourite section, midway through the book, details the weather; the effect of both drought and rain on the land and precious hours of work that can be washed away in an instant. Chloé returns for Christmas, the floods come and – as readers with tears in our eyes – the author details how the dogs cope with the onslaught. He paints a picture of this area like no other can. A troupe of school children from London spend a day enjoying an experience as far from their city life as possible – with tractor-trailer rides that would have the health-and-safety brigade quivering in their boots. They pick oranges from the trees which he cuts in half with his knife: ‘Look, ‘e’s got a knife. ‘e’s well ‘ard.’ In fact, home-grown produce features heavily: nettle soup; boar stew, a fabulous lamb dish with pomegranate syrup and chillies; and what to do with a surfeit of citrus fruit. As in previous books, he bemoans the activity of wild boar and his efforts to thwart their destructive ways. In a wonderful closing chapter he delivers a speech to open Orgiva’s feria. Despite going slightly off-key – equating the opening ceremony with foreplay to suggest that the actual feria might not be as good as the anticipation – he makes a good recovery as he extols the virtues of living in Órgiva. Saying it has the ‘richest mixes of nationalities on the Iberian peninsular’ he thanks the town for looking after his daughter and making his family’s life so pleasurable (we’ve queued next to him in the supermarket, so have done our bit). Now that’s something to think about, isn’t it? I’ve just finished Brenan’s South from Granada, which I loved. Should I skip Stewart’s second and third books and go straight to this one for my next literary return to the Alpujarra? Read ’em all. It’s a kind of journey. Great! I love Chris Stewart’s books so will definitely have to get this one. Have you ever met him? No, we haven’t but see him around town now and again.